Last week was a long one. Since moving into our house almost three years ago, we knew a deck replacement would need to happen sooner rather than later. The old deck was neglected beyond the point of making repairs worth the time or effort. So, during my wife's school vacation week, we tore the old deck out and built a new one. It's nice to have a new and bigger deck, but it felt like a sort of crummy way to spend a week of beautiful weather. Luckily, my friend Harold asked me to join him and guide Steve Taggart on a Saturday afternoon/evening float trip down the mainstem of the Delaware River. 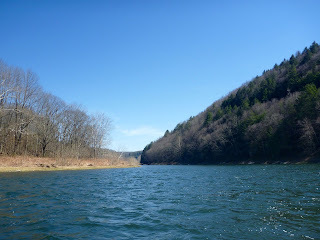 The weather was beautiful, albeit a bit too sunny to make most of the trout willing to come up for a dry fly. Despite the effects of the sun, we were able to headhunt for enough large risers to keep us busy throughout the day. Given the funky wind, I probably should have rigged up my 6 wt. dry fly rod, but I wanted to try out my new 5 wt. combo. I strung up my Beulah Platinum 9' 5wt. and an Abel TR2 reel. 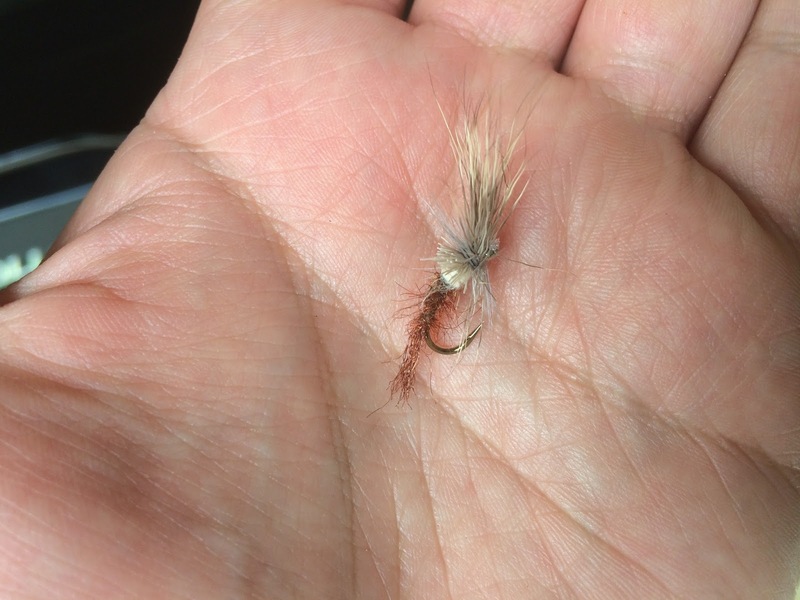 We expected to see Hendricksons on the water, so I tied on my favorite fly for that hatch, a variation on Bob Quigley's deadly Quigley Cripple. It wasn't too long before we found a few risers. This was my first time fishing the Delaware, so it took me a little while to wrap my brain around fish that weren't necessarily staying in one place to intercept insects. Trying to anticipate where the target would rise next was tricky. 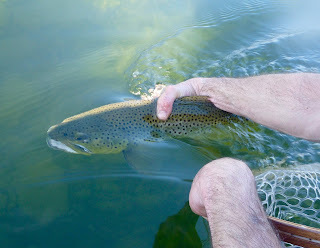 I eventually pinned one down and hooked up to a brown about 16-18 inches. I was surprised at how strong these browns are! They can be difficult to lift. I thought the brown was as good as landed, but it popped off at the last second. A variation on the Quigley Cripple is my favorite fly for the Hendrickson hatch. As the hatch progressed, we moved downstream and continued to hunt for large fish. We struck out in an area with rising fish on the far side of a few complex currents. Throughout the day, we found good targets and managed to prick a few with one of Steve's comparadun patterns. For me, the highlight of the day was when Steve spotted a large trout at the bottom end of a pool. From a distance, it was difficult to tell if it was a trout or a beaver. He was sticking his head out of the water, gulping bugs off the surface. Each time his head went back under, his big back would show, followed by his tail. He was cruising laterally in a fairly broad area. He wasn't traveling in any discenrable pattern, so I tried my best to guess where he would emerge next. After throwing a half dozen casts that went unnoticed, I laid out a cast that happened to landed a couple feet in front of where he was moving. We saw the big head pop up and engulf the comparadun, followed by his back and tail. The hook struck home and it was game on! He didn't run far, but he was very hard to move. I got him on the reel and I was able to hear my new Abel sing a bit. He ran towards the boat and wound up circling us. At one point, I was really worried that he was going to go underneath. I stood upon the boat's middle seat to help clear the line and leader from getting hung up on the boat. 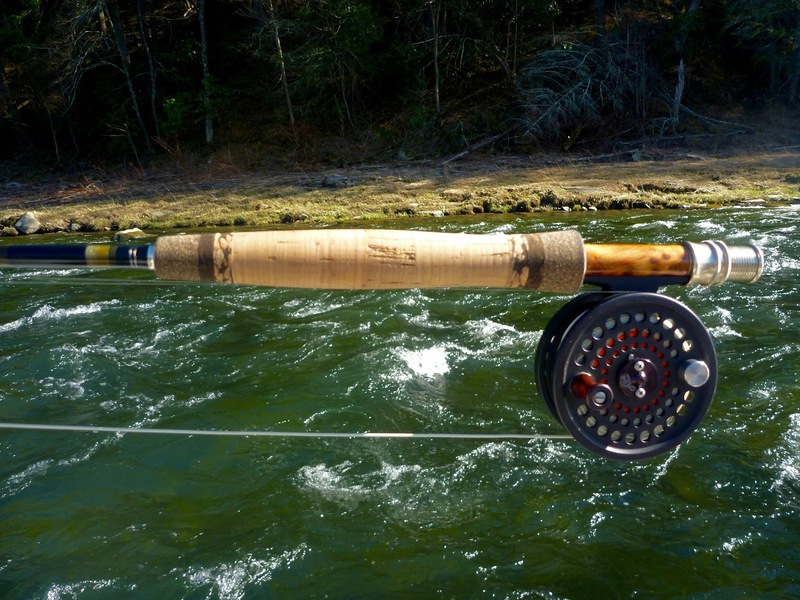 The first attempt to net the big brown trout was unsuccessful. The full length of my 12' leader was outside of the rod tip and I couldn't get the fish high enough. He circled the boat again and I prepared for another landing attempt. Steve gave me the order to strip into my leader when the fish got to the stern. I stripped, then lifted the hefty trout off the bottom of the river. Steve dropped the net at just the right time and the brute was finally landed! He had a great big kype and was a real handful at about 22". The big guy was my only fish brought to hand that day but, when the trout are that big, strong, and difficult to hook, I don't feel like I missed much. Given it was my first time on the Delaware, I was pretty happy with how everything turned out. I can see how this river can be addicting for dry fly fishers. I can't wait to get back. That is a pretty river. I can't wait to fish it. The Big D looks to be pushing some water. I hope your muscles weren't to sore.